Bat Repellant - Chases 'Em Out! 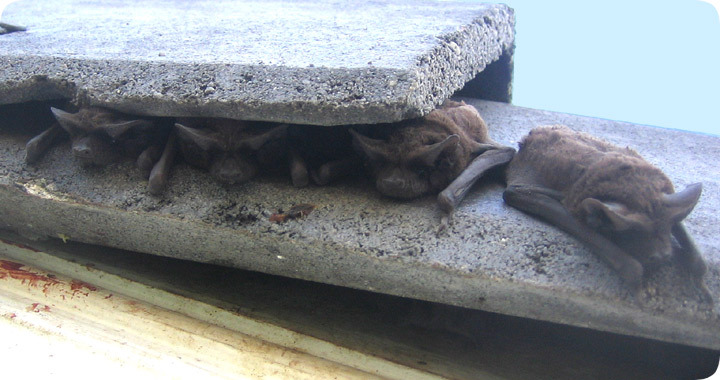 04.04.2007 - What are these crazy bats doing outside of the tile roof during broad daylight? Don't they know that the sun will turn them to dust? What could drive them out of their home and into the cursed light of Earth's yellow sun? Could it be the result of... bat repellant? I know, I know, repellant is actually spelled "repellEnt". But a lot of internet users don't know that, and amazingly, more than a few find my glorious wildlife blog by misspelling. Spelling is overated. Okay then, I'll answer the question: no, these bats were not chased out by any kind of magic bat repellent or bat deterrant, I mean, deterrent. This was a very rare case, and one of the few I've ever seen in which bats have deliberately exposed themselves during daylight hours. I was very surprised to see this, but my theory is that the roof actually overheated. I arrived at this house in the early afternoon, when the tiles would have heated to their utmost, and these were in fact flat black tiles - hot enough to turn a flapjack golden-brown. So the bats probably had to move toward the edges of the tile to escape the insufferable heat. I doubt this was a simple case of overcrowding, because the roof was huge, and the bats could've simply gone further back into the roof. Since they did not, I'll assume it was the temperature that drove them to the edge. So there you have it. I've discovered a perfectly effective bat repellant - 200 degree temperatures. So if you've got bats in your home, just crank up that thermostat, and all of your problems will be solved. Ultrasonic bat repellent device - There are many different items on the market used to repel bats. Most of the items, if not all, are ineffective for bat control and only succeed in taking your money and giving it to a mindless corporation. The ultrasonic bat device is one of the most popular repellents on the market. People assume that because bats use echolocation, they are susceptible to ultrasonic sounds. The first flaw with this theory is that you will never know if your device is working because you can’t hear the noise it supposedly makes. If it does really generate an ultrasonic sound, why does it stand to reason that an ultrasonic sound would be unpleasant? Just because we can’t hear it doesn’t mean it’s a bad noise or one that bats can’t tolerate. Have you ever witnessed a sound scattering all animals of a particular species away? There are some sounds that specific animals might not care for. Certain dogs shy away if you pull out the vacuum cleaner, but this is not across the board, nor does it have much to do with the pitch of the sound itself. Ultrasonic emitters are not worth the money to test them. If you have a bat problem, your best course of action is to call in a professional.